I returned home from three weeks on the Juneau Icefield today and am now doing the final packing for Europe. The weather this year on the Icefield was quite a bit worse than last year’s sunny first weeks. We had one day at Camp 17 when it snowed all day long, followed by a 10-day period of whiteout and rain which prevented helicoptering our GPS gear and other equipment from Camp 17 to Camp 10. Our best weather was from July 17 to 19. In addition to blue sky and sunshine, we had a rare visit by a black bear at Camp 10 on the 18th. We first noticed the bear walking west out of Icy Basin, and over the course of 3 hours it ambled around the base of the Camp 10 hill and into North Basin, staying about 1/4 to 1/2 mile away from camp. At one point it came to a meter-wide crevasse. It walked up to the edge, looked in, then backed up a few paces, got a running start, and jumped across. This was the second bear I’ve seen on the Icefield – about 10 years ago I watched a a grizzly bear traversing the Northwest Branch of the Taku Glacier. View of a black bear on the Taku Glacier in front of Camp 10. The twin Taku Towers are in the left background. Click to view a larger version. Close-up of the bear on the Taku Glacier. I took this with with a small point-and-shoot digital camera, so the quality isn't that great. I’m now boxing up my bike and gear. I take off early tomorrow morning for Oslo via Seattle, Los Angeles, and London. This entry was posted on July 23, 2010 at 7:51 pm and is filed under Preparations. You can follow any responses to this entry through the RSS 2.0 feed. You can leave a response, or trackback from your own site. What’s that Scotty??? 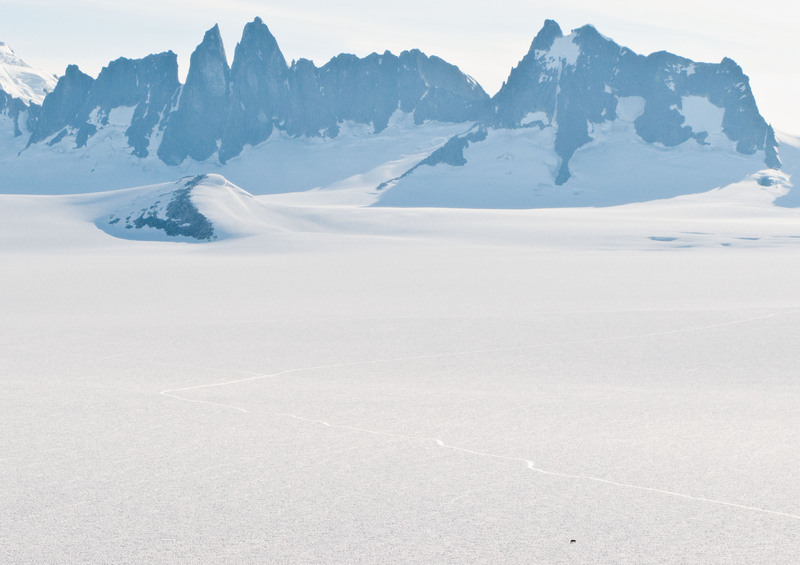 You went up on the icefield with just a small point-and-shoot digital camera????? Yes, I just took the small camera this year. The big one was too much for the short time I was up there. Seeing the bear made me wish I had the big camera though.